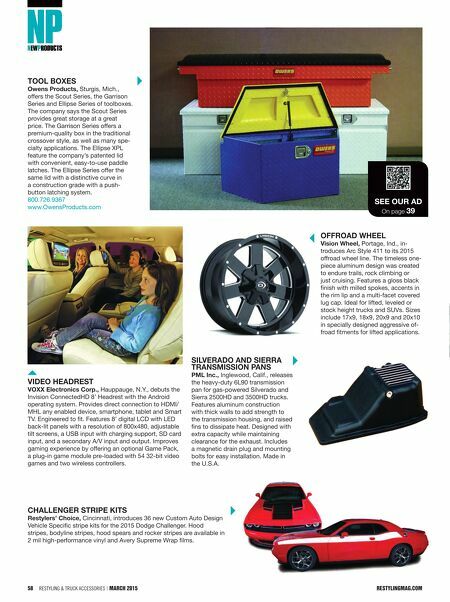 restylingmag.com March 2015 | Restyling & tRuck AccessoRies 59 Chevy TruCk LifT kiTS MaxTrac, Anaheim, Calif., debuts 4.5" and 7.5" Lift Kits for 2007-14 Chevy and GMC 1500 two-wheel drive trucks. Features spindles that address all of the suspension geometry to ensure excellent ride and handling charac- teristics. Constructed of cast ductile iron, these spindles are beefed up in key areas to handle a larger tire and wheel package, and are machined to precise manufacturer specifications. They are also E-coated for a long- lasting finish. The spindle design alters the position of the front wheel hubs and caliper mounts to gain 4.5" of lift while keeping all of the steering and suspension geometry within factory specifications. Bolt-on installation with no cutting or trimming required. Tri-fOLding TOnneAu COver Tonno Pro, Surprise, Ariz., offers its Tonno Fold vinyl tri-folding tonneau cover for 2015 Ford F-150 pickups. Installs quickly by one person; no drilling required. User can travel with the truck bed cover in either the open or closed position, permitting use of a fifth wheel trailer without removing the cover. Made using a 6063-grade, powder-coated aluminum frame, tear-resistant double-sided vinyl, impact-resistant EZ clamps, and rubber seals to prevent leaking. APPLe CArPLAy dASh reCeiver Alpine of America inc., Torrance, Calif., launches the iLX-007 in-dash receiver with Apple CarPlay. Features 7" capacitive touch screen and flat-face design. Gives drivers seamless access to the most popular iPhone features to help make and receive calls, access iMessage, play music, and get driving directions. Siri voice control included. Audio, driving directions and phone calls are played though the vehicle's speake r system. With Apple Maps, Apple CarPlay can predict where the user is going by using destinations from recent emails, text mes- sages, contacts and calendar entries. Users may also set destinations through a simple, conversational command to Siri. Uses a Lightning connector and is compatible with iPhone 5 and later, including iPhone 6, iPhone 6 Plus and the latest version of iOS. 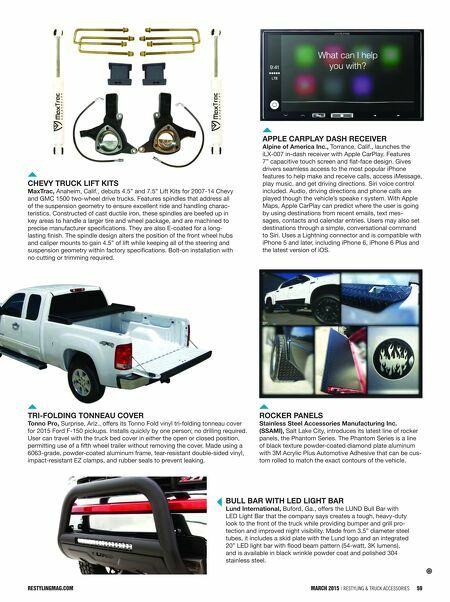 BuLL BAr WiTh Led LighT BAr Lund international, Buford, Ga., offers the LUND Bull Bar with LED Light Bar that the company says creates a tough, heavy-duty look to the front of the truck while providing bumper and grill pro- tection and improved night visibility. Made from 3.5" diameter steel tubes, it includes a skid plate with the Lund logo and an integrated 20" LED light bar with flood beam pattern (54-watt, 3K lumens), and is available in black wrinkle powder coat and polished 304 stainless steel. rOCker PAneLS Stainless Steel Accessories Manufacturing inc. (SSAMi), Salt Lake City, introduces its latest line of rocker panels, the Phantom Series. The Phantom Series is a line of black texture powder-coated diamond plate aluminum with 3M Acrylic Plus Automotive Adhesive that can be cus- tom rolled to match the exact contours of the vehicle.